Burkhard Bilger talks about the fine line between culture and caricature. Kazuo Ishiguro -- the author of novels such as The Remains of the Day, The Unconsoled, and now When We Were Orphans -- talks about memory, desire, and a loss of innocence. Ian Buruma amplifies on the cross-cultural ironies that run through his eclectic collection of essays The Missionary and the Libertine: Love and War in East and West. More on politics & society in Atlantic Unbound and The Atlantic Monthly. There's much more to the questions about standards and testing than most politicians would have us believe. A collection of Atlantic articles explores the history, the context, and the implications of educational standards and testing in this country. In his new book, The Big Test: The Secret History of the American Meritocracy, Nicholas Lemann argues that the structure of educational opportunity in America is inherently flawed and must be rebuilt. See an index of Atlantic articles about education. Polls this year have shown that a majority of Americans consider education reform to be the single most important policy issue facing the next President. Why, in a democracy, citizens want to know, are socioeconomically disadvantaged children virtually guaranteed a third-rate education? And why are American children regularly outperformed by children of other nations on international educational assessment tests? 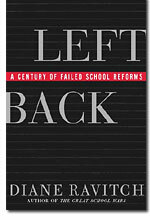 In Left Back: A Century of Failed School Reforms, the policy analyst and education historian Diane Ravitch seeks to answer such questions by reviewing the evolution of American schooling from the turn of the last century to the present. In Ravitch's telling, the story of American public schools in the twentieth century becomes a fable about an education system led astray by the far-fetched notions of anti-intellectual "progressive" educators, and about the need to reinstate the rigorous standards and teaching methods favored by many traditionalists on the right. 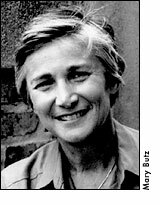 Ravitch's views on education -- characterized by some as moderate-conservative -- tend to be forceful and clear: she has little patience for pedagogical approaches that coddle students or in other ways circumvent the difficult but, in her view, essential work of making sure that all children master an "academic curriculum" (by which she means "the systematic study of language and literature, science and mathematics, history, the arts, and foreign languages"). At the outset of the twentieth century, Ravitch argues, American schools shared a commonly agreed upon mission of educating "all children to high standards" in academic subjects. But, as her new book shows, in the century's early decades a new emphasis on free expression and group learning led to chaotic classrooms with vague lesson plans. A new enthusiasm for curricular tracking and intelligence testing conspired to relegate a majority of students to vocational, "nonacademic" programs, and a cult of "social efficiency" aimed to teach students only what they would need to know for practical living: "useless" subjects like history were sometimes replaced by classes in cooking, driver education, and accounting. In short, Ravitch argues, once the school's central purpose as a transmitter of humanity's accumulated knowledge and wisdom had been undermined, "Every perceived need, interest, concern, problem, or issue found a place in the curriculum or provided a rationale for adding new specialists to the school's staff ... because all needs were presumed equal in importance." In Ravitch's view, then, the current preoccupation with establishing "standards," requiring "testing," and demanding "accountability" (buzzwords heard so frequently during this election season) represents an effort to reclaim a common-sense conception of education that the American school system abandoned a century ago. Ravitch clearly hopes that her account of how a series of misguided reforms led us away from a commitment to rigorous schooling for all can perhaps also help to show us the way back. "If schools know and affirm what they do well," she writes, "they can liberate themselves from the fads and panaceas that have often been inflicted on them by pressure groups, legislators, and well-meaning enthusiasts.... It is time to renew the academic tradition for the children of the twenty-first century." Ravitch served as an assistant secretary of education in the Bush Administration, and until December of last year was an education adviser to George W. Bush's campaign. She has been a professor at The Columbia University Teachers College and at New York University, and currently holds the Brown Chair in Education Studies at the Brookings Institution. She has written numerous books on school standards and American educational history, including What Do Our 17-Year-Olds Know? (1987), The Schools We Deserve (1985), The Troubled Crusade (1983), The Revisionists Revised (1978), and The Great School Wars (1974). She spoke recently with Atlantic Unbound's Sage Stossel. What was the impetus behind this book? When I started the book in the late 1980s I intended to write a history of the teaching of the humanities -- history and literature -- in American schools in the twentieth century. As I worked on it, I realized that I had to figure out why "social studies" had replaced history and why "language arts" had replaced the teaching of language and literature. I realized that I had to explore larger issues, to try to understand and write about the legacy of a constant drumbeat of criticism against the academic curriculum which resulted in limiting access to the academic curriculum only to college-bound students and created a culture of low expectations. So I ended by trying to understand in historical terms what is often referred to as the "dumbing-down" of the schools. And your research showed that the "dumbing down" started earlier than was originally thought. Yes, the common view, at least among people who believe that something has gone wrong in the schools, is that something happened in the sixties. The books that have been written over the past ten or fifteen years usually say it was the pursuit of "relevance"; that is, the schools' eagerness to please students in the sixties watered down the curriculum and lowered expectations in the schools. What my research suggested is that these changes were set in motion way before the sixties, and that the themes of the sixties, if anything, were no more than an echo of themes from the twenties, thirties, forties, and fifties. Your description of efforts during the 1990s to "create a coherent framework of academic expectations that could be used by teacher educators, textbook publishers, and test developers" makes clear just how difficult it is to try to develop national educational standards. So far it's proved impossible to achieve consensus on standards in any field. In your view is it worth continuing to try? Yes. I think we should continue to strive for consensus on standards, because in most fields it makes little sense to have fifty states with fifty standards. Mathematics is not different in the fifty states; it operates by the same principles in California as in New York, or in Tokyo or Paris or Mexico City, for that matter. So it doesn't make a whole lot of sense to have fifty different math standards. There should be some consensus about what students need to know for college or technical work. But the consensus has to be one that's based on field-testing. If one or several states believe that they have the best math standards, they have to demonstrate their success through solid research and testing, and others will learn from their experience. We have a federally funded testing program now called the National Assessment of Educational Progress. States should be able to demonstrate by their performance on that test whether their math standards are actually improving student achievement. States where performance continues to be low can look to the highest-achieving states and learn from them. Eventually, as a nation, we will begin to have the consensus that has so far eluded us. It won't come about because people sit around a table and talk about how to make it happen, but through experience and a steady commitment to continuous improvement. When a new Administration takes office in January, what do you hope its educational agenda will look like? The first thing that I would like to see a new Administration do is take a hard look at current federal education programs and begin the long and difficult process of changing those programs so that they're more effective. I could go through one program after another and point out to you how poorly they function in terms of improving the education for the kids who are involved. The prime example is Head Start, which is probably the single most popular federal program. The idea of Head Start was to give disadvantaged preschool kids extra help so that when they started school they would have some of the advantages that middle-class kids were acquiring at home. That should include not only nutrition and health services, but cognitive skills as well. Unfortunately, Head Start always gets bad evaluations when it comes to children's cognitive improvement -- whether they arrive at school better educated, or better prepared to succeed in school. The most recent national evaluation, which was commissioned by the Department of Health and Human Services, showed that students who enter Head Start know zero letters, and at the end of a year they know only one or two letters. The reason that they learn only one or two letters, the evaluators said, is because their teachers aren't trying to teach them any letters. This has been the case for quite a long time. Head Start has focused almost entirely on providing nutritional and medical and social services. It pays very, very low salaries to its teachers and therefore is able to recruit only people with very minimal educational backgrounds. About a third of its teachers are parents of Head Start children. I think that a strong effort at the federal level would turn this program into a real "head start" program where children continue to get nutritional, medical, and social services, but are also given very intellectually stimulating and engaging educational preparation -- so that when they arrive in kindergarten or first grade they know their letters, they know numbers, they have a great enthusiasm for learning, and they start at the same place where advantaged middle-class kids start. That would be an example of the kind of thinking that I would hope a new Administration would bring in. But if the new President goes to the stakeholders in Head Start, they will tell him to keep the program exactly the way it is. One could go through many other federal programs -- I think, for example, of the Safe and Drug-Free Schools and Communities Program, which evaluators regularly have rated negatively as a pork-barrel program with no effectiveness -- and see the same kinds of negative evaluations, the same kinds of missed opportunities, and the same adherence to a status quo which makes sure that the money gets out there but doesn't make sure that kids are actually getting the benefits. I would hope the new President would come in with a willingness to effect change. Which candidate do you think is most likely to do that? I don't want to get involved in partisan issues. I'm not expressing a preference. One of the most contentious education-policy questions today is whether states should institute rigorous testing programs with penalties for schools whose students perform poorly. In a recent Atlantic article on the subject, the education-policy writer Peter Schrag described you as a proponent of testing, but as having qualms that testing might backfire if so many students and schools failed to measure up that standards ended up lowered or abandoned altogether. Do you think there are ways to implement a testing program in such a way as to circumvent those concerns? Today most states are implementing some kind of testing program. Some of these programs will inevitably be revised. There's a good deal of experimentation as states try to figure out how to devise good standards programs, and how to align their tests to their standards. It's not fair to test children on material and skills unless they have had an opportunity to learn them. The effort to measure performance is a valuable step forward because it provides important information. As a result of the measurement of student progress, states are now willing to spend much more money on improving their schools and improving student achievement: because of what has been learned about student performance, there has been a new focus on providing better preschool education, reducing class size, and improving teacher quality. All these efforts have come about because legislators are trying to narrow the very large gap between low-performing and high-performing students and between children from different races. When legislators make a big investment in education, they want to know whether the new programs are making a difference or not. They are not likely to continue making new investments without any measures of performance. Thus far there have been very low stakes attached to testing. In almost every state, students had multiple chances to pass the tests for their grade. If they are not able to do so, they then get extra instructional time -- summer school, longer school days, or other kinds of programs intended to make sure that kids are learning more than they are now and enough to keep up with their peers. I don't think there is a single way to implement a good testing program, but I think the states have to be committed to an ethic of continuous improvement, and to recognize that where the testing is unfair or invalid they must take steps to improve it. The SAT, originally billed as a "general intelligence test," has by now become deeply entrenched in American society. Would you prefer to see the influence of this test diminish because it purports to test what kids are capable of learning rather than what they've been taught? The verbal section of the SAT is primarily a test of vocabulary and reading, and the math section is really not an intelligence test as much as it is a test of mathematics course-taking. Of course, the College Board also offers, in addition to the verbal and math portions of the SAT, a number of achievement tests. I have for many years preferred achievement tests to aptitude tests, and I would in every case prefer that colleges rely on achievement tests rather than solely on the SAT. Should we be heartened by the fact that the math scores this year were reportedly the highest they've been since 1969? I believe that the math scores have gone up because course-taking in math has gone up. There has been a huge increase in the percentage of kids of every racial and ethnic group, both boys and girls, taking math courses -- especially advanced math courses. If anything, I think this proves my overall thesis, which is that as expectations are increased and kids respond to them, we will see achievement improve. What's really disheartening is the fact that the verbal SAT scores are almost as low as they've ever been. They're nowhere near where they were in the mid-1960s. In 1994, the College Board "recentered" the SAT scores. So whereas we now say that the average SAT verbal score is around 500 or 505, in fact, if we were using the old scale that had been in place from 1941 to 1994, the SAT verbal scores would be somewhere around 430. So we have the paradox that math scores are going up while verbal scores remain low. The reason for that, I believe, is two-fold. Several studies have shown that the vocabulary of textbooks in almost every subject has been diluted over recent decades and made easier. But also, leading professional organizations like the National Council of Teachers of English have for many years de-emphasized such things as teaching vocabulary, grammar, syntax, and the importance of close reading. The failure to teach the conventions of the English language, especially vocabulary, inevitably influences SAT verbal scores for the worse. Your historical account in Left Back attributes the rise of progressive educational theory at the beginning of this century mainly to a few very influential men -- Edward L. Thorndike, G. Stanley Hall, David Snedden, and a few select others. To what extent was educational progressivism an inevitable outgrowth of a changing national ethos, and to what extent did it represent the efforts of a few committed individuals? Educational progressivism was in some sense a reflection of a very basic national ethos of anti-intellectualism that had been part of the frontier tradition. Book-learning was scorned, and doing useful things was what average folks really admired. But significant committed individuals -- the leading progressive figures -- had a great deal to do with shaping the ideology at the schools of education. The leading progressives reflected changes in the national ethos, especially the romantic appeal of social science and the desire to make the schools socially efficient and rational; some wanted the schools to serve society, especially industrial society, and others wanted the schools to transform society. Neither group had much regard for academic learning. Progressive ideas dominated the discourse, and progressivism cornered the market on what it described as "modern science." These leaders advocated dividing kids up into curricular tracks and allocating access to the academic curriculum, which many of them scorned. School districts that took their advice were hailed as being on the cutting edge of educational theory and practice. IQ testing, for example, was launched by progressive educators. (A lot of "progressives" today are absolutely shocked to hear this.) IQ testing and curricular tracking were, in the first half of the last century, considered to be modern, progressive, and scientific. School systems that didn't use IQ tests and that tried to give all kids a common academic experience were considered very backward and reactionary. There are all sorts of ironies in looking at this history afresh. Many progressive educators in the early part of this century advocated teaching immigrant children American citizenship and useful vocational skills instead of focusing on academics. Was this approach misguided? The schools that had large percentages of immigrant children were very quick to adopt industrial education and vocational programs starting at a very early age. The junior high school was invented, for example, as a way to start the vocational sorting of children at the age of twelve -- which is really very early for deciding what a young person's career should be. This did not happen because immigrants were demanding vocational training, or because immigrant parents wanted their kids prepared for factory work, but because the progressives were wedded to the idea of social efficiency, and they thought that the schools could make their best contribution to society by preparing immigrant children for industrial jobs. Progressive educators talked about immigrants being different: they said immigrants were more interested in manual occupations, whereas the most advantaged native-born American white children should be prepared for college because they could handle what they called "a bookish education." It was surely social-class snobbery, and the documentation of that snobbery is overwhelming in the writings of such leading progressives as Ellwood P. Cubberly of Stanford University. You argue that no student who wants an academic education should be denied: neither IQ, socioeconomic background, gender, race, nor any other criterion, should be used to force a student into a nonacademic track against his or her will. In your view, should nonacademic education even be an option? In other words, should students who express a preference for vocational training be compelled to complete an academic program anyway? If one were to say that students can choose whatever courses they want, there would probably be students -- and they would be overwhelmingly from low-income and disadvantaged backgrounds -- who would say, "I'd rather not have a science course; I'd rather not have a math course; I'd rather not have a history course; and I'd rather not have a literature course." So there are two considerations. First, Is it good for society if large numbers of people are ignorant of science, math, history, literature, and foreign languages and the arts? I'd say no -- it's not good for society. And second, Is it good for the individual? I'd have to say no, it's not good for the individual either. So then the question is, At what point should students choose their own courses? Certainly for the first eight years, ten years, or eleven years, students should have a very rich and full academic education in which what is available for the most advantaged students is also available for the most disadvantaged students. If at some point toward the end of their high-school career students want to prepare for jobs, that's fine, but it should not become a reason to deny them the same opportunities that are available for more advantaged students, long before they are able to make an informed choice. Otherwise we end up with a very inequitable system, where those who come from socially advantaged families are getting a lot more preparation and far more opportunity for advancement than those who don't have the background to make good choices for themselves. You write, "In no other country is school practice so quickly responsive to the suggestions of professional students of education.... Compared with other countries, ours is the educational experts' paradise." Are there theoretical trends now emerging in the pedagogical schools that you see as especially pernicious or promising? The fundamental progressivist antipathy toward knowledge that got a foothold in education colleges in the 1920s (sometimes even earlier) continues to be a problem in the field of pedagogy. Just the other day I had a conference with a colleague who is chair of a major social-studies department, and he was decrying the fact that those with whom he teaches don't like history. They want to teach "social studies," but not history. They don't see the value of learning anything about the past. It's very hard to understand how social studies can be taught by those who are deeply antagonistic to teaching history, which should be the very cement and glue of the field. Another troubling trend, which seems to be emergent, is a great fascination with what's called "brain-based" learning. This is apparently a distortion of what cognitive scientists have learned about how children learn. There are scores of workshops being offered now to teachers and administrators on brain-based assesment, brain-based learning, and brain-based supervision. But the most advanced cognitive scientists today say that we don't know nearly enough about studies of the brain to be able to draw practical implications for the classroom. I think that this is yet another trend that may seem to offer easy answers to learning, instead of getting down to the business of preparing excellent teachers of mathematics and science and history and literature and foreign languages and the arts who can teach students what they need to learn during the time they're in school. Left Back takes the American school system as its focus. How do the changes that took place in American schooling over the course of the twentieth century compare with the evolution of schooling in other developed countries over the same time period? Is there another nation whose school system, in your view, serves as an ideal model for reform in our own system? Most other countries, in contrast to our own, have a very highly professional and centralized ministry of education. We never have; ours is a very decentralized federal system, in which control is spread across 15,000 school districts, fifty states, and the federal government. We have to work with our own traditions and try to go through our own particular kind of struggle to improve. I don't believe we should be like, say, the Japanese or the French or some other school system that's outscoring us in international assessments. We can learn from other countries about what they do in the classroom and whether or not it seems to be effective. But I don't think we can import some other country's tradition and impose it on our own schools and classrooms. Has the response to Left Back so far been what you had expected or hoped? I think the response thus far has been more positive than I had anticipated. The book has gotten extremely good notices in The New York Times Book Review, The New Yorker, The Nation, and The Wall Street Journal. I expect that the education journals will be less friendly because the book is largely a criticism of the progressive tradition in education, which is a sacred cow in some precincts. So I expect criticism from defenders of that tradition. But I think that they will have to come to terms with their forebears. The target of my book is not progressivism as such (my own children went to progressive schools), but anti-intellectualism. Progressives today will be better off if they can understand their history and distance themselves from the elitist, anti-intellectual tradition that my book describes. Sage Stossel Atlantic Unbound's senior editor. Her most recent interview was with Robert Putnam.